Interview The "certainty" that underpins European and UK climate policy may be wildly misplaced, as the models that the climate science establishment presents to politicians as evidence run far too hot. That's according to a report released yesterday by UK think-tank the Global Warming Policy Foundation. And this is very good news, says the report's author, Nicholas Lewis. Lewis is a relative newcomer to climate science who published his first peer-reviewed paper in 2011. Lewis also submitted written evidence published in the IPCC's Fifth assessment Report, AR5. Lewis doesn't disagree that CO2 contributes to global warming - and most of the additional CO2 is caused by humans. The science today, however, shows around half a degree of surface temperature warming manifesting itself over the next 70 years. This the most important climate discovery in recent years - and you may reasonably think it should have grabbed the headlines. However, with politicians pleading to be told what to do by scientists, the IPCC process - dominated by bureaucrats and politicians - pulled its punches. It acknowledged the finding but only referred to the lowering obliquely, and didn't explain why its own estimates had been lowered. It omitted to make a "best guess" at all - unlike in previous blockbusters. We spoke to Lewis this week to unravel the mystery, and explain his workings after the publication of his review of the AR5's physics assessment yesterday (PDF). Lewis's subject is climate sensitivity - the response of the system to increasing amounts of greenhouse gas forcings - and this is the kernel upon which climate science is based. Lewis studied maths and physics at Cambridge and his career included modelling: he's an expert on the uses and misuses of Bayesian mathematics. Lewis also told us he'd already found schoolboy maths error in the IPCC's AR4 published in 2007. 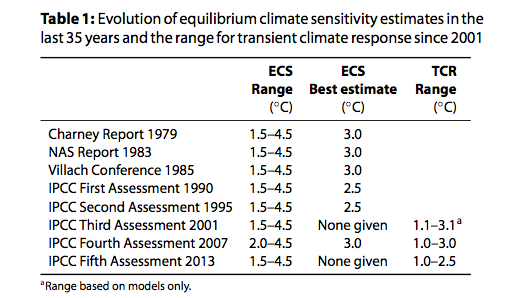 The core of climate estimates is two key figures in the basic physics: equilibrium climate sensitivity (ECS) and the transient climate response (TCR, a figure derived from ECS). Climate sensitivity is the response of the system to a doubling of a forcing, by the time it reaches equilibrium. TCR is a more useful figure since it shows the response over a shorter time frame. Once the latest observational evidence is incorporated, these are lower than previously guessed. "It's slightly counter-intuitive," Lewis agrees. "Because of a better understanding of aerosols we think they play less of a role in the climate. So in a period where the temperature hasn't really changed, the influence CO2 must be less than thought." The observed temperature increase to date could result from a high climate sensitivity combined with a large aerosol cooling effect, or a low sensitivity combined with a small aerosol cooling effect (or combinations in between these extremes). Therefore, to the extent that aerosol forcing is small, sensitivity to carbon dioxide concentrations must also be relatively low. AR5 uses a combination of simulations and satellite observations to derive its aerosol forcing estimate. But satellite observations, Lewis adds, put aerosols even lower. Q. The biggest surprise to readers who haven't followed this closely is how little warming we'll see in this century. It isn't what you read in the papers - or hear from NGOs or activists. How much warmer is it going to be? Lewis: If you take the IPCC AR5 figures, we have total forcing of 2.3 W/m2 [watts per square metre] anthorpogenic and another 0.1C natural - we haven’t had much natural forcing)- say 2.4 W/m2. Of that, between 0.4 and 0.6 W/m2 is being absorbed by the ocean. 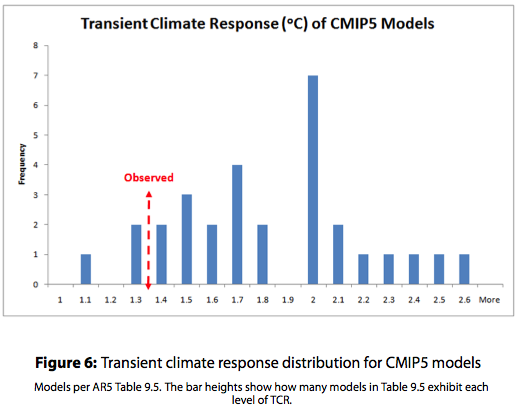 (Trenberth’s reanalysis not based on new observations)The most recent estimate is that under .5˚C absorbed in the ociean. That would mean that one-third of that 2.4 W/m2 is still going into the ocean whereas the other is cancelled by the higher radiation from earth because of temperature. So 0.75 W/m2 to 0.8 W/m2 has nullified three-quarters of the forcing we’ve had. So in equilibrium would have to nullify the other quarter too. But that would take a long, long time. Q. There's a contradiction here between the two methods. You and some others are using the energy conservation model. The high numbers come climate models (general circulation models, or GCMs). Why when the "science is certain" are there such different outcomes? Lewis: The basic reason they get such high figures - if you take the ones starting from pre-industrial levels - is that the models have a higher sensitivity going forward: they use an average of TCR of 1.8-1.9 W/m2 in practice, which is more than the 1.5 W/m2 allowed for past forcing. Some models also have some linearity in them. Most are linear - the forcing goes up in a straight line. Others have a worsening at high forcing levels. The difference between models is feedbacks. Q. 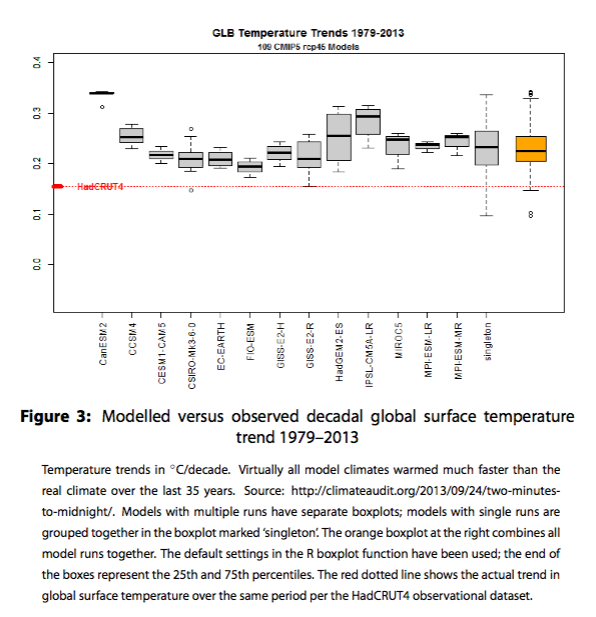 Why don't climate models reflect the basic "equation"? Lewis: The models are not seeded from the equation. They supposedly obey basic physics in terms of how they model thermal dynamics and circulation. What determines ECS is the feedbacks in the model. Now, some of this physics are based on reasonable physics - like water vapour feedback and the lapse rate feedback. But some are far from perfect. IT's in the 2:1 range. When it comes to cloud feedbacks, they cannot do it from the basic physics at all. So the modellers "parameterise" the clouds. That doesn’t come from basic physics at all, and the cloud feedback varies WILDLY between models. Why some ECS have a 2.1 and some 4.6. Q. Clouds are pure guesswork? Lewis: Yes. Some of the emissions scenarios produced by models are pretty aggressive. ARP 8.5 for example is in the 90th percentile. Cloud feedback varies from -0.4 W/m2 in ccm4 (from the National Center for Atmospheric Research, NCAR) up to +1.2 W/m2 for IPSL-CM5A (Pasteur Institute). That is a huge range; the way they try to analyse them is complicated. You've spent a lifetime modelling - surely they're not completely useless"
Q. So what is the new evidence that has changed the estimates? A little or a lot? Lewis: It's because the estimate for the forcing from aerosols - which includes pollution and the particulates from volcano eruptions has been cut. This has two effects. Firstly, the TCR estimate is now lower. Secondly there is less scope for the natural internal variability to be responsible for the temperature increase that we have had. Q. The "wildcard" is less 'wild'? Lewis: The IPCC would argue - and I wouldn’t dispute this - that we can be more certain that greenhouse gas is the most important forcing, the bulk of which is anthropogenic. But at same time our best estimate should be lower. Q. Can your elaborate on your approach. It appears to be take slices of history, comparing time frames of the same length where the forcings were well known. Essentially a deductive approach?